The boarding house lies in the small village Nevcehle, which is located 7 km to the northeast of Telč and 20 km to the south of Jihlava. The old cottage has been rebuilt resulting in a boarding house with a grass court, covered garden-seats with an outdoor barbeque and plenty of flowers. Inside, there is a bar and a hall with an indoor fireplace. Two rooms with three beds and one room with four beds are available throughout the whole year. The place is suitable for those who want to spend their holiday in peace, making interesting trips and visiting cultural monuments. 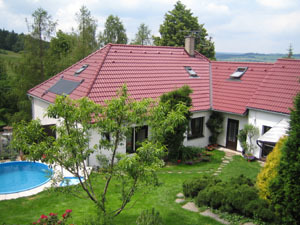 It is set in a very pleasant environment and the house, with lots of flowers, is the perfect place for a family holiday.